The second time in the last month is that something like this is happening. Steem was sold in large quantities and a sudden drop in price was caused by this. This price drop is not so much but if we have signs of rising of BTC it's expected that STEEM follow that trend as many other alts. We hope for a quick recovery and go back to old good paths. To the moon. Congratulations! This post has been upvoted from the communal account, @minnowsupport, by mightymicke from the Minnow Support Project. It's a witness project run by aggroed, ausbitbank, teamsteem, theprophet0, someguy123, neoxian, followbtcnews, and netuoso. The goal is to help Steemit grow by supporting Minnows. Please find us at the Peace, Abundance, and Liberty Network (PALnet) Discord Channel. It's a completely public and open space to all members of the Steemit community who voluntarily choose to be there. 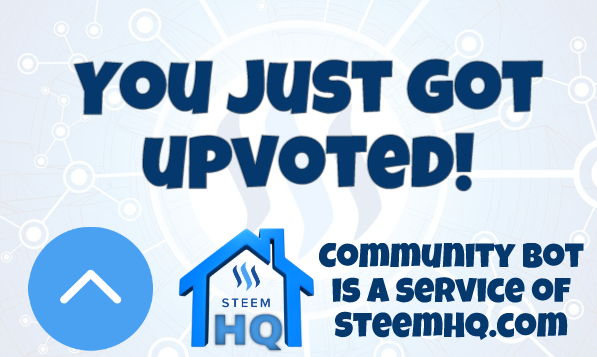 you just received a 21.60% upvote from @steemhq - Community Bot!